An acquaintance recently told me about a favorite and once thriving shrub that was in serious decline. The problem: over time, branches from a nearby tree had grown and spread so widely that they were shading out the sun-loving plant. The only viable options: severely prune back the mature tree and destroy its structure, or risk digging up the mature shrub and transplanting it to a more favorable location. A major change was needed. As ambulatory beings, we human beings are fortunate. If an environment is unhealthy or not to our liking, we generally have the option of walking away and putting ourselves in a better place. Not so with plants. They are permanently rooted to one spot—unless we move them—and they must adapt and thrive or wither and die. In a natural setting, plants are completely at the mercy of environmental factors, living to old age only if conditions are favorable. On the other hand, plants growing in a garden setting rely on their human caretakers to provide for their needs: proper sun exposure, healthy soil, adequate water and nutrients. We must be vigilant over time, watching as plants grow and conditions change, because a landscape (like a growing child) is a living, dynamic, ever-evolving thing. Commercially-grown plants have been raised under optimal conditions, with carefully scheduled watering and fertilizing, precisely engineered soil mix, efficient pest control, and constantly monitored air circulation. Once they make their way from grower to nursery to home, they must usually contend with less than ideal circumstances. Annual plants—with lifespans of only a year—usually manage to complete their life cycle even if we mistakenly plant them in a poor place. But other plants—long lived trees, shrubs, and other perennials—need to be monitored to ensure that they remain healthy over the long term. It's an approach equivalent to an annual medical exam. To ensure that your garden thrives, begin by following the principle of “right plant, right place.” Each species of plant evolved in its own niche in the world, and thus has its own preferences for soil type (loamy, sandy, clayey, rocky), sun exposure (full sun, partial shade, full shade), water needs (low, moderate, high), heat and cold tolerances, and more. If you duplicate these conditions as much as possible and choose a planting location carefully, your chances of success are high. Another element of the “right plant, right place” concept involves space. Each type of plant grows to a specific size when mature, so you should take this eventual size into consideration when formulating a planting plan. People and plants are alike in many ways. An outdoorsy, sun-loving person won't thrive in a dark and gloomy office. Someone who prefers cool, shady climates will wilt if relocated to a hot place. Those from dry locales can quickly become depressed when spending time in a rainy, soggy environ. Such comparisons can be extended to the plant world. All living things have specific and very individual needs in order to flourish. Before you choose a plant, consult a reputable source such as the Sunset Western Garden Book, a knowledgeable nursery professional, or a horticulture specialist. If the size of your site and the planting zone and conditions coincide with the plant's needs, chances are it will be happy once it's in the ground… and it will be a beautiful day in the neighborhood. For gardening-related questions, call the UC Master Gardener office at 209-953-6112, or use our website: http://sjmastergardeners.ucanr.edu/CONTACT_US/. 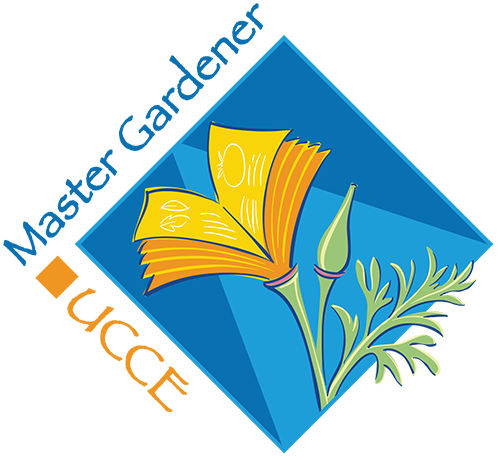 The logo for the UCCE Master Gardener Program blends our state flower, the California poppy (Eschscholzia californica) with the pages of a book, representing the program’s focus on horticulture-related education. Master Gardeners go through an extensive training program and background screening, and once certified, they must also complete annual requirements for volunteer hours and continuing education. In other words, when you enlist the help of a Master Gardener, rest assured that you're receiving top-notch assistance. One of the primary ways San Joaquin Master Gardeners help county residents is through our Help Desk, which is open from 9:00 a.m. to noon from Monday through Thursday. For general gardening questions, you may contact the help line at (209) 953-6112. If you need help with identification of a pest or weed, or diagnosis of a plant disease or problem, it's best to contact our volunteers by email (anrmgsanjoaquin@ucanr.edu), or to visit our office in person at the Robert J. Cabral Agricultural Center, 2101 E. Earhart Blvd., Suite 200 (off Arch-Airport Road in Stockton). When using email, it's helpful to send a few clear photos along with a description. If coming to our office in person, please bring an intact insect or a large plant sample in a tightly sealed clear plastic bag or jar, to prevent potential spread of a harmful condition or invasive pest. Our “UCCE Master Gardeners of San Joaquin County” website is another key part of our outreach, with countless articles, helpful links, and other garden-related information appropriate for our area. The information available is far too extensive to list here, so set aside some time to visit our site and explore its many resources. California Native, Edible, Foliage, Mediterranean, and Pollinator—are designed to inspire and educate visitors. Plant specimens are labeled with both scientific and common names; informative signage explains the garden's sustainable design elements and irrigation system. Visit the landscape on your own, or look for notice of our biannual public event: Open Garden Day, held in both the spring and fall. Garden Notes, our quarterly newsletter. Both current and prior issues are available online; visit our website and click on the newsletter link on the home page. The “What's Growing On” blog—of which this article is a part—which is a series of weekly articles on a wide variety of garden-related topics. The full series of articles is available at http://blogs.esanjoaquin.com/gardening/. Monthly workshops in Stockton and Manteca. Check our online “Calendar of Events” for locations, dates, and times. The annual Smart Gardening Conference, which is next scheduled for March 3, 2018. Specific details and registration information will soon be posted on our website. The School and Community Gardens Committee, with expert consultants that can help your organization establish and properly maintain an edible or ornamental garden. We currently work with the Boggs Tract Community Farm, the Stockton Emergency Food Bank garden, the garden at the LOEL Senior Center in Lodi, the Black Urban Farmers Association, and many other school and community sites throughout the county. Community outreach. San Joaquin Master Gardeners volunteer their time and talents at various special events throughout the County: farmers' markets in Stockton and Tracy; AgVenture programs in Lodi, Manteca, and Stockton; Arbor Day events throughout the county; Stockton's Earth Day Celebration at Victory Park; the Sandhill Crane Festival in Lodi; and many more. 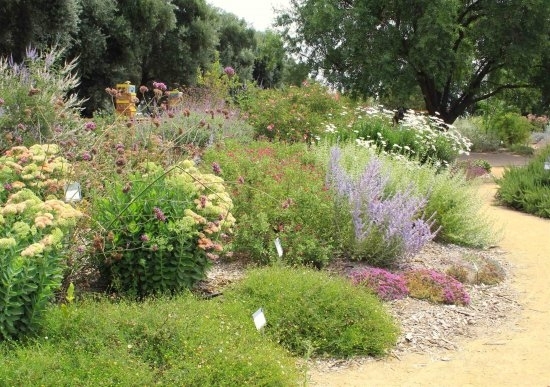 The California Garden Web, a portal to UC's collection of garden-related research. The California Backyard Orchard, with guidance on growing fruit and nut trees at home. Integrated Pest Management (IPM), on how to cope with garden problems while minimizing impacts to the human and natural environs. ANR Publications, with a wealth of UC-published books and pamphlets. 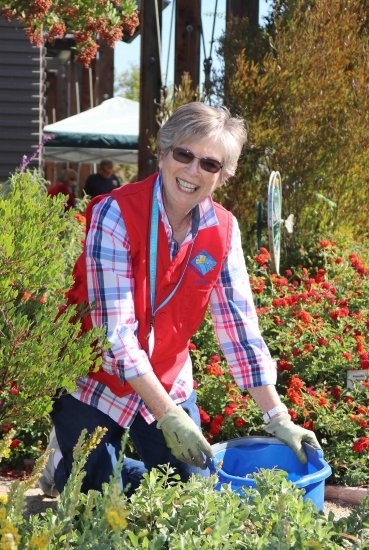 Master Gardener volunteers throughout California have donated nearly five and a half million hours of their time—and San Joaquin Master Gardeners have donated almost 49,000 hours in the last ten years— to help people like you with garden-related questions and issues. We're always glad for opportunities to serve you, because gardening is our passion! If you have any questions about the San Joaquin Master Gardener programs mentioned above, need help with gardening-related questions, or would like to become a Master Gardener yourself, please call our office at 209-953-6100, send us an email at anrmgsanjoaquin@ucanr.edu, or visit our website. A friend asked me recently if there are modest sized trees to plant for shade. Her recent experience was removing a Magnolia tree which had cracked up her driveway. The back-hoe operator, who took out the root-ball, said it was the largest he had ever removed. We have to be wary of planting trees that grow too large for their space or so large that they are very expensive to remove them when their expiration date comes around and all living things do have an expiration date. Recently, I removed three large, old evergreen conifers from the backyard of my new home to make room and sunshine for growing dahlias and vegetables. It was costly and made me aware that planting trees that grow to a large size can be a financial loser. Eastern Redbud in full bloom in March at my old country home. When it comes to planting the right size tree and a beautiful one there is a tree that fills the bill and that is Autumn Blaze Maple. It is a patented hybrid of red and silver maples. Whereas red maple (Acer rubrum) is a large tree to 120 feet in nature, the hybrid ‘Autumn Blaze' (Acer x freemanii ‘Jeffersred'), has a maximum height of 50 ft. It has brilliant eye catching red color, dense branching and rapid growth. It is fast growing, disease resistant, tolerates a wide range of soil conditions, doesn't drop seed pods and is resistant to car exhaust pollution. Another red maple cultivar is Acer rubrum ‘columnare'. It grows in a more column like manner, elliptical in form but spreading more in maturity. There is a beautiful pair of red maple trees across the street from my home and I think they have the ‘columnar' appearance. Unfortunately, they were planted a bit too close to the house, but the current owner didn't plant them and when he discovered how attractive they are in the fall, he decided not to remove them. For more information on Red Maples, click here. When it comes to selecting smaller trees that work for areas under power lines, PG&E has a list of recommended trees that are under 25 feet for you. You can find more about this and order a brochure from this website . One smaller tree that will not exceed 25 feet is crepe myrtle (Lagerstroemia indica). There are a variety of cultivars and the National Arboretum has released over 24 hybrids selected for cold hardiness, resistance to powdery mildew and other pests, and for varying heights, vigor, habits, flower colors, fall foliage colors, and bark characteristics. All U.S. National Arboretum cultivars have Native American names. Powdery mildew commonly infects older varieties. 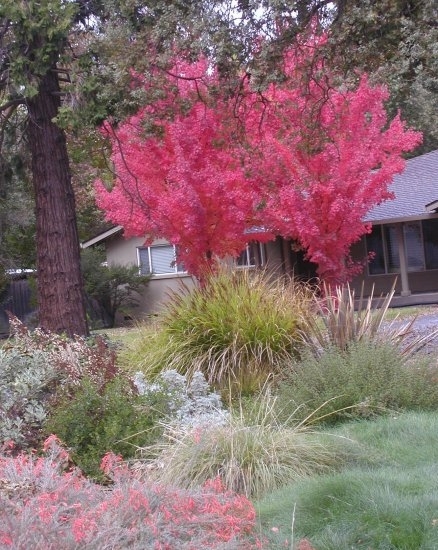 Acer palmatum ‘Bloodgood' is a good small tree for the Central Valley as it handles heat better than some Japanese maples. It will do better if afforded some afternoon shade, but it can handle full sun. It needs moist soil, so is not a drought tolerant variety, but will appreciate mulching to conserve moisture. Its maximum height and spread is about 20 ft.
Red maples in my neighbor's front garden. eastern cousin, with a more intense magenta bloom, but grows more like a shrub than a tree reaching only 20 feet. Pineapple guava (Feijoa sellowiana) is an evergreen tree of 15 ft. height and as wide with edible flowers and edible fruit. They are deer resistant, if you live in deer country, and seem to be generally pest-proof. Once established they are drought tolerant and although self-fruitful, I have never had any fruit on my solitary tree so better to plant more than one if you want the fruit. They can tolerate some shade and require only light pruning to shape them. They make a good screen plant and can be pruned into a hedge though not recommended. Whatever tree you plant, may it be beautiful, small and tidy. You may have seen Mistletoe hung in doorways over these past few weeks. It is a traditional holiday decoration, but when it's growing on trees in the landscape, this parasitic plant may not seem quite as charming. There are two types of mistletoe: broadleaf and dwarf. Broadleaf mistletoe (Phoradendron macrophyllum) is an evergreen parasitic plant that grows on a number of landscape tree species in California. Hosts of broadleaf mistletoe include alder, Aristocrat flowering pear, ash, birch, box elder, cottonwood, locust, silver maple, walnut, and zelkova. Other species of broadleaf mistletoe in California include P. villosum, which infests only oaks, and Viscum album, which attacks alder, apple, black locust, and cottonwood. Dwarf mistletoes (Arceuthobium spp.) infest pines, firs, and other conifers in forests, and can be a problem in forest landscapes such as in the Sierra Nevada foothills. Leafy mistletoes have green stems with thick leaves that are nearly oval in shape. Plants often develop a rounded form up to 2 feet or more in diameter. The small, sticky, whitish berries are produced from October to December. Mistletoe plants are either female (produce berries) or male (produce only pollen). The berries of the female plant are small, sticky, and whitish; they are very attractive to birds such as cedar waxwings, robins, and others. The birds feed on and digest the pulp of the berries, excreting the living seeds that stick tightly to any branch on which they land. In most cases, the initial infestation occurs on larger or older trees because birds prefer to perch in the tops of taller trees. After the mistletoe seed germinates, it grows through the bark and into the tree's water-conducting tissues, where rootlike structures called haustoria develop. The haustoria gradually extend up and down within the branch as the mistletoe grows. Initially, the parasitic plant grows slowly; it may take years before the plant blooms and produces seed. Broadleaf mistletoes have succulent stems that become woody at the base. Old, mature mistletoe plants may be several feet in diameter, and on some host species, large swollen areas develop on the infected branches where the mistletoe penetrates. If the visible portion of the mistletoe is removed, new plants often resprout from the haustoria. Dwarf mistletoes are smaller plants than broadleaf mistletoes, with mature stems less than 6 to 8 inches long. Dwarf mistletoe shoots are nonwoody, segmented, and have small scalelike leaves. While broadleaf mistletoe seeds are dispersed by birds, dwarf mistletoe seeds are spread mostly by their forcible discharge from fruit, which can propel seeds horizontally into trees up to 30 to 40 feet away. Broadleaf mistletoe absorbs both water and mineral nutrients from its host trees. Mistletoes also can produce energy through photosynthesis in their green leaves. Healthy trees can tolerate a few mistletoe branch infections, but individual branches may be weakened or sometimes killed. Heavily infested trees may be reduced in vigor, stunted, or even killed, especially if they are stressed by other problems such as drought or disease. In newly developed areas or in older established areas where trees are being replaced, the ideal method of controlling or preventing mistletoe is to plant trees believed to be resistant or moderately resistant to mistletoe. Avoid trees like Modesto ash, known to be especially susceptible to mistletoe infestation. Some tree species appear resistant to broadleaf mistletoe. 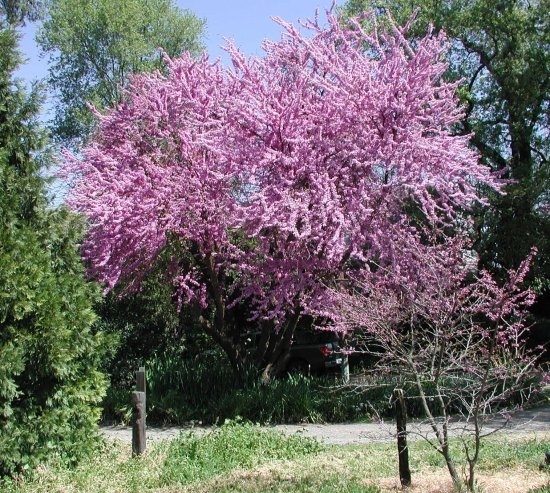 Bradford flowering pear, Chinese pistache, crape myrtle, eucalyptus, ginkgo, golden rain tree, liquidambar, sycamore, and conifers such as redwood and cedar are rarely infested. These or other resistant species should be considered when planting in infested areas, or when replacing infested trees. For treatment of existing trees it is important to remove mistletoe before it produces seed and spreads to other limbs or trees. Mechanical control through pruning is the most effective method for removal. Growth regulators provide a degree of temporary control but repeated applications are required. Severely infested trees should be removed and replaced with less susceptible species to protect surrounding trees. 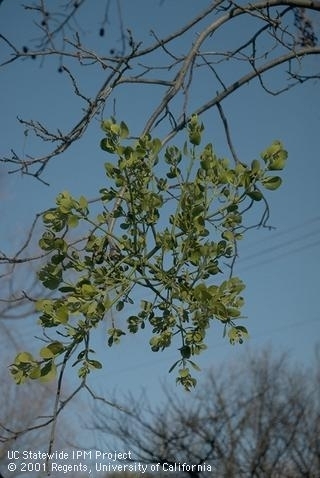 The most effective way to control mistletoe and prevent its spread is to prune out infected branches, if possible, as soon as the parasite appears. Using thinning-type pruning cuts, remove infected branches at their point of origin or back to large lateral branches. Infected branches need to be cut at least one foot below the point of mistletoe attachment in order to completely remove embedded haustoria. 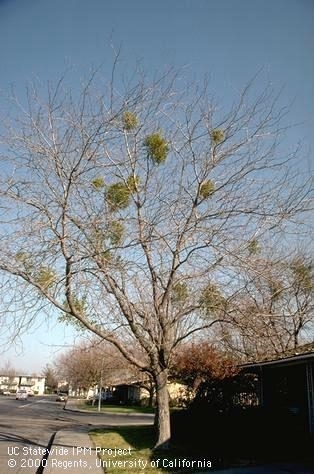 It is best to call an arborist if mistletoe is infesting your trees and you are unable to reach it to prune it. Mistletoes infecting a major branch or the trunk where it cannot be pruned may be controlled by cutting off the mistletoe flush with the limb or trunk. Then wrap the area with a few layers of wide, black polyethylene to exclude light. Use twine or tape to secure the plastic to the limb, but do not wrap it too tightly or the branch may be damaged. Broadleaf mistletoe requires light and will die within a couple of years without it. It may be necessary to repeat this treatment, especially if the wrapping becomes detached or if the mistletoe does not die. Simply cutting the mistletoe out of an infested tree each winter, even without wrapping, is better than doing nothing at all. Even though the parasite will grow back, spread is reduced because broadleaf mistletoe must be several years old before it can bloom and produce seed. If you have a fruit tree, you know that gardeners are not the only ones who enjoy the bounty of the harvest. 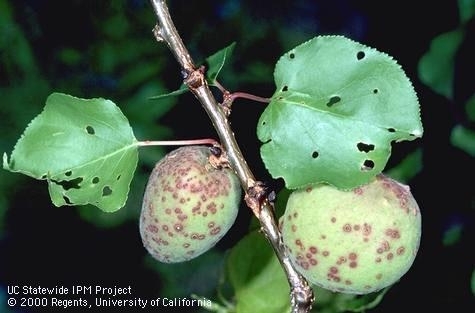 There are many pests — such as scales, aphids and mites –that feast on the tender plant parts and these same pests overwinter on the fruit trees. Dormant oils help control these annoying pests and are safe for use on fruit trees. Some dormant sprays are applied to control over-wintering insects, while others are used to prevent disease infection. While dormant sprays are commonly used on fruit trees, they can also benefit roses and other ornamental shrubs that might develop insect or fungal disease problems as the warmer weather arrives in the spring. Dormant sprays should only be used in conjunction with good garden sanitation. Be sure to rake up and dispose of all fallen leaves and debris that may harbor fungus spores and overwintering insects. Dormant oil is a refined petroleum product formulated for fruit tree use. It has been in use for well over a century in commercial orchards, and is still regularly used today. It is classified as an insecticide, and acts by coating over-wintering insects hiding in tree trunk and limb bark with a suffocating layer of oil. Oils used at this time of year include insecticidal oils, narrow range, supreme and superior oils. Dormant disease control applications use materials such as copper, lime sulfur, Bordeaux, and synthetic fungicides. Dormant sprays provide efficient and economical treatment for a number of over-wintering pests and diseases such as: scale, peach twig borer, aphid eggs, leaf curl, powdery mildew and shot hole. • Apple and pear – dormant oil helps control scale, overwintering aphids, mite eggs and pear phyla. • Apricot – dormant oil helps control scale, mite and aphid eggs and peach tree borer. Never use sulfur on apricots. • Cherry – is susceptible to oozing from gummosis (Bacterial canker) and may respond to dormant sprays containing fixed copper. 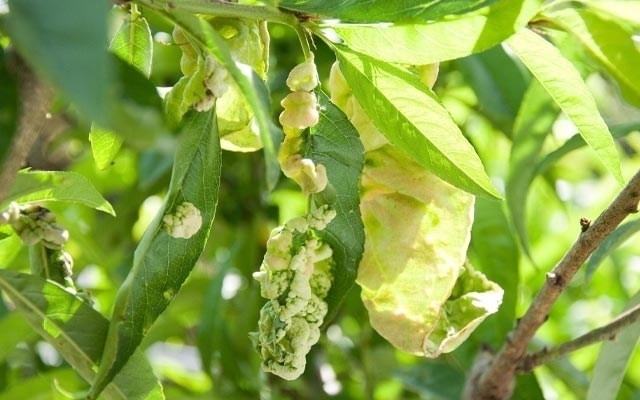 • Peach and nectarine – require repeated applications of fixed copper spray to control peach leaf curl. In December or January, prune off half to two thirds of last season's growth to stimulate new fruiting wood. Spray the ground after removing leaves and branches. Use dormant oil if scale is present. • Plum and prune -dormant oil helps control scale and overwintering aphid and mite eggs. Apply copper for shot hole fungus. Heavy pruning may be needed to help control tree size. Spray ground after clean up. • Nut trees- remove any nuts still hanging on the tree. Spray with dormant oil to control scale. Oil sprays also help control peach tree borers and mite eggs. A dormant spray may not be required every year in the backyard orchard. For some insect pests and diseases, one dormant application may be adequate with good spray coverage. For other problems, up to 3 applications may be necessary for good control. Decide if you need to apply by noting the amount of insect and disease pressure during the previous growing season. If you decide to spray always read the label and follow the directions, more is not better. Make sure you dress in protective clothing, including long pants, a long-sleeved shirt, chemical-proof gloves, and safety goggles. Treat at the beginning of dormancy in late November and again just before the buds begin to open in February or early March. One way to remember when to consider dormant spraying is to do so around Thanksgiving, Christmas and Valentine's Day. Once flower buds begin to open you may damage fruit and kill pollinating bees if spraying is done at this time. Therefore, it is important to spray at the proposed times before “bud break”. Spraying after pruning allows maximum coverage since there are no leaves to block the spray. A good time to spray is right after a period of rain or foggy weather but not during fog, rain or right before a freeze. Avoid spraying trees that are showing signs of drought stress. Sprays can be applied with a pump sprayer or hose-end sprayer that is sized appropriately for the number of plants you need to spray. The sprayer should be clean, in good working order and not been used for any herbicides. Spray the entire dormant plant taking care to saturate every branch, stem or cane as insects and the tiny dust-like spores of fungal diseases hide in the smallest nooks and crevices. Don't use a dormant spray on any plant that has any leaves or is actively growing. Leaves, especially tender new growth, may be damaged by the spray from the impurities in the oils or the reflection of the sun off the oil. Dormant oils generally won't harm beneficial insects since they are applied at a time when beneficial insects aren't present on fruit trees and have a low toxicity level to humans and mammals. Furthermore, dormant oils won't leave harsh residue behind. It loses its ability to control pests once dried.